St John’s Way is a stunning regenerated development that has transformed the local landscape of St John’s Hill, Battersea. This exciting redevelopment of a tired 1930s estate has revitalised residents’ way of life through unique and robust architectural features, both inside and out. Phase 1 has seen St John’s Way become re-integrated with the wider community after a conscious decision to tear down the walls that once enclosed the forgotten estate. New public space and a convenient, pedestrianised path connect Clapham Junction to Wandsworth Common, creating a dynamic place to live. 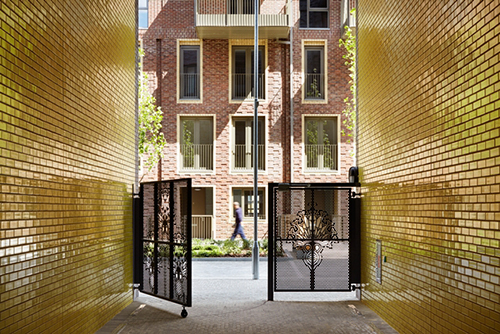 Each building benefits from its own striking architectural identity, achieved through unique, complementary brickwork. Inspired by local heritage, bespoke brick-relief artwork has also been expertly incorporated into the exterior design to enhance visual interest. The generously-proportioned and sustainable, affordable rent, shared ownership and private sale homes also all benefit from private gardens, balconies or terraces, alongside a landscaped communal garden.